Wood floors come in a variety of styles to meet the demands of today's busy life styles -- factory finished, unfinished, solid and engineered. With a vast variety of species, both domestic and exotic, color options, hardness, and price ranges, there is a wood floor to suit everyone. We can help you achieve the look that is right for your lifestyle and decorating style. You can create unique, one-of-a-kind looks. The possibilities are endless -- consider a border in your dining room or a medallion in your foyer. Everyone is "green" conscious. Wood is naturally renewable and biodegradable. It is the only flooring that can be refinished and recycled. Today's finishes are better than ever before; they are durable and minimal maintenance is required. (Compare to constant carpet cleaning!) Wood creates a healthy environment, minimizing the risks of dust allergies. It is easier on your body than some other flooring options. Click here to visit the Trees are the Answer website. 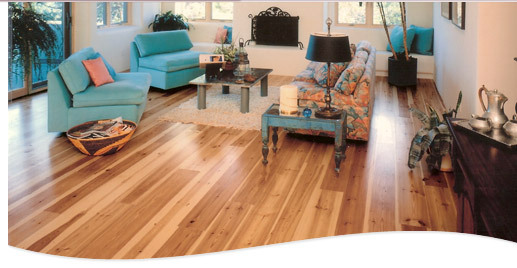 Wood flooring increases the value of your home, and realtors agree that homes with wood flooring sell faster. 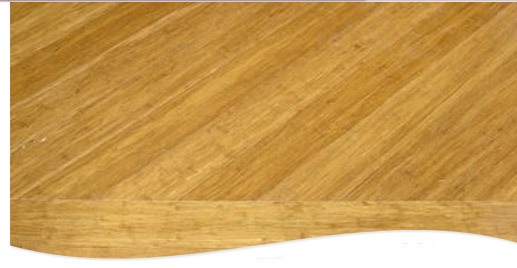 So, it is cost effective for homeowners, builders and renovators to select wood flooring. We can purchase wood from any manufacturer. After close analysis, we have chosen to display the best possible choices for a variety of budgets. There are a wide variety of domestic and exotic wood species available. The Wood Floor Store staff is knowledgeable regarding what has been popular with homeowners in the past as well as current hardwood flooring trends. Borders create a frame effect in a particular room and generally contrast to the main area of the room. The pattern possibilities are endless and can incorporate multiple wood species. Medallions usually are installed in the main field of the floor, typically in areas such as foyers. They can incorporate multiple wood species. Factory finished medallions can be routed into existing floors with minimal disruption. For more customized looks, we can work with you to select the species and colors that will best meet your needs. You can also supply a picture for a custom medallion, such as a corporate logo, family crest, hobby or theme. In years past, we only installed medallions in solid floors; now medallions come any thickness to match the thickness of your flooring. Our Invention!!! Engineered wood flooring is manufactured in layers or plys. The layers are pressed together with grains running in different directions. Sold as strips or planks, they can be glued to concrete or nailed or stapled to a plywood sub floor. Engineered woods were developed for installation in areas with variable humidity levels and are more stable than solid woods. Most engineered woods are pre-finished at a factory with multiple coatings of polyurethane and aluminum oxide particles under ideal conditions. Finishes are generally guaranteed for between 10 and 25 years. Engineered wood flooring was basically invented for the Florida climate. Since most construction is on slab, engineered flooring can be glued to the slab. Most construction up North is plywood. Some manufacturers provide pre-finished solid wood flooring. Solid 3/4" flooring whether unfinished or pre-finished must be nailed to a plywood sub floor for a proper installation. Like engineered pre-finished wood, it has a factory finish. Factory finishes are more wear and scratch resistant than anything we can apply manually. However, there is nothing scratch proof! Although it is pre-finished, it still must be acclimated prior to install. In Florida, we recommend widths less than 4" unless you choose the distressed Patina (6-7" is popular). Floating floors are not fastened to the sub floor. They are installed over an underlayment which is primarily a moisture barrier. You will hear more noise when walking on a floating floor than you will with a glued down or nailed down floor. Recently, there are some upgraded underlayments available which will help acoustically. The boards are wider and longer and have a 3-strip, 2-strip or plank look. Wood flooring is easier to maintain than ever before. Keeping your floors vacuumed to remove sand and grit is important to maintaining your finish. Use a hardwood floor cleaner recommended by your flooring professional, such as Bona Kemi. Remember to never let spills lay on the flooring and do not wet mop hardwoods. Mops with washable terry cloth covers are available to use with your cleaner. Also, use furniture glides on any furniture that moves such as your dining room chairs. Never slide furniture or other items over an unprotected wood floor. Use area rugs near entrances and exits. We are an exclusive dealer for Patina Old World Flooring, a manufacturer of reproduction French Parquets and rustic wide plank flooring. Patina's hand scraping technique creates a surface where each individual board is unique. Offering a variety of wood species and colors (including custom colors), this old world look is absolutely gorgeous! Finally, we can install wider solid planks. Some manufacturers offer engineered woods in a rustic or distressed look which are not custom orders, but offer old world charm and character. Reclaimed woods come from old or historic buildings. There is also river recovered. Unfinished solid hardwood is sold in the form of non varnished rough 3/4" thick strips. The strips must be nailed to a 3/4" wood sub floor with a moisture barrier for a proper installation. A wide variety of species, grades, and widths are available. Unfinished flooring must be acclimated for several weeks before installation. The installation, sanding, and finishing process takes much longer than installing a pre-finished floor. Some home owners may also want their flooring stained. The Floor Doctor uses a dust containment system during the sanding phase. It is best if the homeowner can arrange for accommodations during the process. Your flooring professional will advise you on the process from beginning to end as well the types of finishes available. There are different types of finishes available; oil based and water based are the most common. Discuss your finish with your flooring professional to see exactly how it is to be cleaned and maintained. Following your flooring professional's instructions will keep your floors looking beautiful for a lifetime. Bamboo is not a wood; it is a grass. Bamboo has been cultivated in China for over 4,000 years. It rejuvenates quickly, growing to maturity in 5-6 years. It is harder if cut from the bottom of the stalk. This product presents a unique pattern intrinsic in bamboo in either its natural light tan/yellow-like color or, created through a steaming process, a medium honey-brown/carmel "carbonized" color. Some manufacturers also provide colors in any shade you can imagine. Bamboo is offered in horizontal, vertical, or strand configurations. The horizontal format reveals more the true character of bamboo while the vertical grain version accentuates the linear look. Strand bamboo is pressed together. Bamboo can be glued, floated or nailed down. Even though it may be prefinished, we recommend some to be acclimated one month prior to installation. Sweeping with soft bristle broom or vacuuming with soft floor attachment. 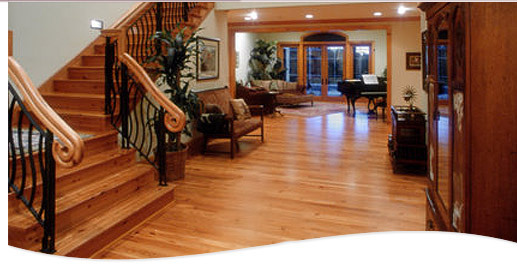 Use a professional wood floor cleaning product such as Bona Kemi hardwood floor cleaner. Use furniture glides on moveable furniture. Luxury Vinyl flooring is an amazing material if you’re looking for something that is both a great value and long lasting. It is softer under foot than ceramic tile and wood, which makes it a great choice in kitchens where you’ll spend a lot of time standing. Its ability to hold up under the harshest of conditions is why it is used frequently in commercial settings. Breakthroughs in digital printing allow manufacturers to create the look of expensive wood floors with stunning realism at a fraction of the cost of the real material. Another huge benefit of using Luxury Vinyl flooring is the easy maintenance. It is highly water and stain resistant. You will only have to sweep up dirt and debris periodically. If you need a deeper clean, you only need to use a damp mop. Follow all manufacture cleaning instructions. We sell the best brands of Luxury Vinyl flooring available. Call or stop in today to see our entire selection! Cork is harvested from the bark of the cork oak tree indigenous to the western Mediterranean region, primarily Spain and Portugal. Cork is the soft tissue composed of dead cells found in the inner bark with a honeycomb structure that has 100 million air cells per cubic inch. Trees must be at least 25 years old before the first harvest. The older the tree, the better the quality of cork it can produce. Cork flooring comes in a variety of colors and patterns. Some color variations are expected since cork is a natural product. Some can be sanded and some can't be sanded. May be floated or glued. Acclimate 48 hours or more at jobsite maintaining temperature and relative humidity consistent with conditions when the building or home is occupied. Comfortable - A comfortable cushion underfoot as it gives under compression. It has a "memory." Durability - Resistant to wear due to its cellular composition. It is factory finished with polyurethane. Some may have a UV cured or acrylic finish. Low Conductivity - Cork is a sound and thermal insulator which is why it is used in churches, libraries, galleries, and homes. 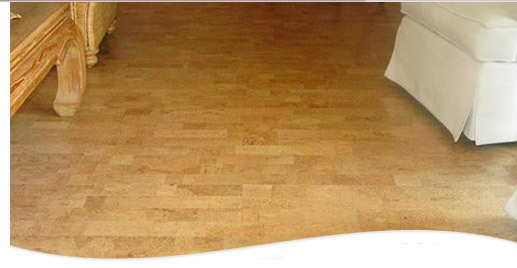 Anti-Static, Hypoallergenic - Cork floors do not absorb dust, do not cause allergies and are resistant to mold and mildew. Fire Retardant - Natural fire inhibitor and does not spread flame; nontoxic. Impermeability - Impermeable to liquids and gas. Earth Friendly - A naturally sustainable resource. Cork contains natural pigments and is subject to fading. Where possible, use drapes or other window coverings to protect your cork flooring from excessive light. Area rugs and large furniture will block light exposure and cause uneven coloration. To minimize this, move rugs or furnishings periodically. Cork floors expand and contract in response to fluctuations in temperature and humidity. Maintain moderate temperature and relative humidity. To clean, sweep or vacuum frequently to avoid dirt build up which could scratch the finish. Do not use abrasive or cleaners that contain glycerin. You may damp mop with a well wrung out sponge and a neutral detergent or cleaner that mists over the surface. Excess moisture will cause swelling at the seams. You may use Bona Kemi Hardwood Floor Cleaner. Use a minimum 2"-wide caster on chairs with casters and mats under these chairs to protect finish. Furniture or chair feet should sit on a wide coaster to prevent excessive indentation and disperse weight.